Battery power is not infinite. It is important to ensure that your users don’t find themselves without any battery power right when they need it the most. The Sapphire Battery Utility allows you to read the current battery level and inform the user whether the device will require recharging. This will ensure the user can plan ahead and keep the device charged up. Implementation couldn’t be easier, simply declare the DLL function as a function within your application and call it as though you wrote it yourself. Here’s a sample how to ready the battery level within VB.NET. 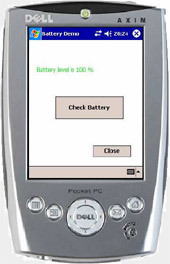 lblBattery.Text = " Battery Charging...."
lblBattery.Text = " Battery level is " & lPercent & " %"
Developer's Licence cost 49 GBP.